OMG, I'm so far behind on blogging. Last night a little before midnight, Angus (who likes to spend some time out back before he comes in for the night) was growling at something in the yard. I poked my head out back and could see some sort of pale shape on the lawn. Hmmm, odd. It wasn't the cats and it wasn't moving. I went back inside and grabbed a flashlight, and was quite surprised to find a very large opossum in the yard. Angus was pretty excited about it, but I'm pleased with how he handled the situation. He growled and barked some, but mostly just walked around and around it, very curious, but not attacking at all. He did go up and sniff it, but I told time to leave it and he backed off. I don't want him going after animals without permission (ah, the good old rat-hunting days with Jessie and Nellie!). Anyway, I wasn't quite sure what to do about it. They're not real high on my list of predators to be worried about. I'd only ever seen one around before and it was after eggs. But the chicks are young enough that they are still sleeping on the ground, and that might prove pretty tempting even for a bumbling 'possum, so I didn't really want it around. 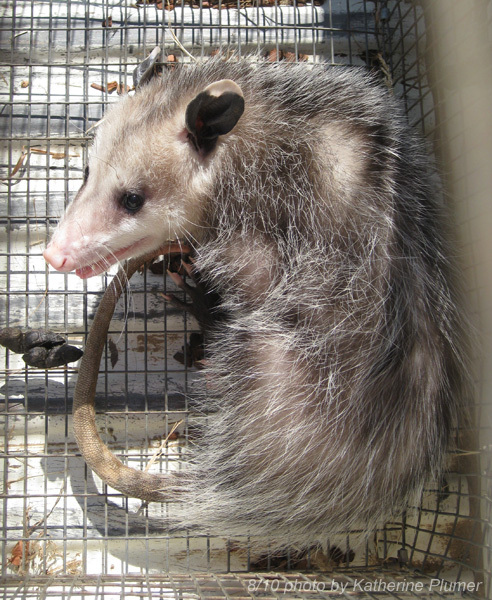 I have no ill will toward opossums (yet?). So I dragged Mom outside and instructed her to keep the flashlight shining on its face so it wouldn't wander off. Meanwhile, I went out to the barn and grabbed a chicken cage, walked right up to the critter and plonked the cage down on top, then shooed it to the other side of the cage so I could tip it upright and shut the cage door. I took it for a drive this morning, found a long lonely stretch of road with some trees and fields and a ditch full of irrigation water. Looked like a good place for it to live and not pester anybody's chickens. I let it go, and it ambled off into the bushes. I thought it was almost kind of cute all curled up this morning with its paws on its face. Then again, they are kind of like giant rats, and oh what big teeth they have. So, it must be asked, did it play 'possum? 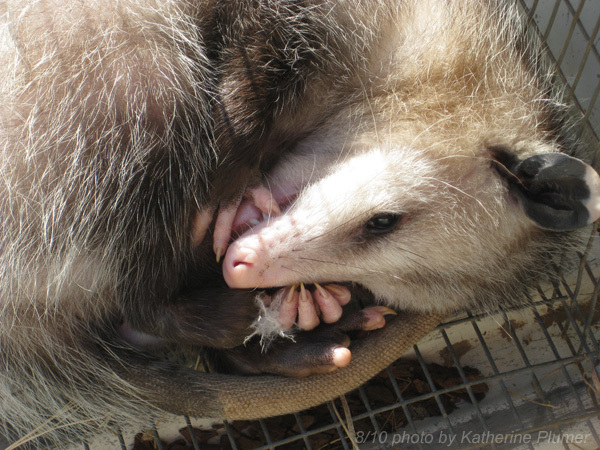 When Bob was 8, MB at Wildlife Care showed him how to pick a possum up by the tail. It didn't do much good then because he wasn't tall enough for it to clear the ground. They had a "keeper" possum that was huge, he used to carry it around slung over his shoulder like a cat. Good for you for relocating it. No, actually, it did not play possum.